South of Avignon is La Chaine des Alpilles , a barren chain of wild limestone rocks and it covers a small area , a narrow strip barely 20km by 4km, It truly is a very captivating miniature world which feels lost in time and remote from anywhere. Les Alpilles form an extraordinary, beautiful landscape of weirdly jagged crests emerging abruptly from flat country between the rivers Durance and Rhone and rising in a series of hills. In places they are weather worn and barren , sometimes planted with olive groves, almond, cypress, fruit trees and vineyards.Elsewhere the slopes are very densely cloaked with garrigue , wild ever green vegetation. The air is very alive with the creaky scratching of insects and the amazing aroma of pine and wild herbs. The Alpilles are populated with picturesque Southern villages and also important Roman and medieval sites in and around the area. Les Antiques is one of the antique Roman remnants, standing at a roadside less than 1km outside of St Remy de Provence. The most dramatic is the Roman mansoleum, it dates from around 30 bc and was built as a memorial according to the inscription. Next to it stands the Roman arch, decorated with carvings probably by Greek craftsmen, it probably marked the entrance to the town of Glanum. The more serious Glanum archeological site lies across the road. Adjacent to it is the old monastery of St-Paul-de-Mausole where Van Gogh, resided in an asylum from May 1889 to May 1890 after cutting his ear. His room and the gardens he painted, may sometimes be seen while visiting the attractive Romanesque church and cloisters. It really worth the stop. Perched on a dramatic cliff edge among the stony heights of the Alpilles, it is today a “must see “sight given entirely to arts and crafts vendors who thrive on the thousands a day visitors, walking the narrow picturesque streets of restored buildings. There is plenty to see, including the musee Yves Brayer , the ruins of the Old citadelle ( Ville Morte), lots of lofty views over the surrounding hills. At the foot of the village many more sights to look at such as La Cathedrale des images, a spectacular former bauxite quarry; the Val d’Enfer a gorge filled with chaotic rocks and caves; and Pavillon de la Reine Jeanne ( Queen Jeanne’s Pavillon), a charming 16th-century renaissance structure. 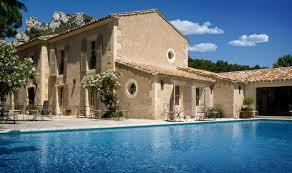 built for the Baroness Jeanne de Quiqueran of les Baux , who never became a queen. Where to eat and stay. L’Oustau de Baumaniere. http://www.ousteaudebaumaniere.com. 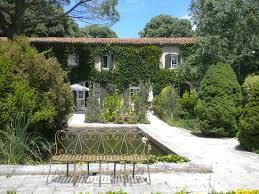 Is considered one of the best hotels in the world, it compromises 3 buildings of a beautiful 16th- century Provencal farm offering refinement and luxury, yet with pleasing simplicity and unpretentiousness among beautiful gardens and guarrigues. Vegatables, herbs and fruits are grown in the garden for the kitchen staff to use and organic vines whose grapes go into Chateau Romanin, an outstanding local wine. L’ousteau emphasises light exquisite cooking focused on Fish and vegetable dishes. 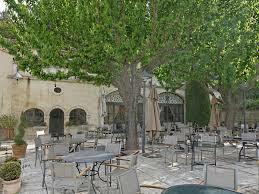 Enjoy a great meal on the terrace gazing up at the ruins of Les Baux. La Cabro d’Or, Val d’Enfer.www.lacabrodor.com is an annexe of l’Oustau de Baumaniere. This too is a luxurious hotel and restaurant with tremendous character and refine style, set among trees and flowers, tennis, riding, pool, first class restaurant. 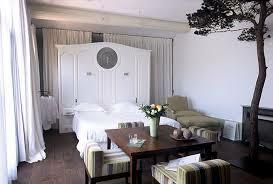 Auberge de la Benvengudo, below the village; Tel: 04-90-54-32-54. Rustic and luxurious farmhouse in a wonderful setting. 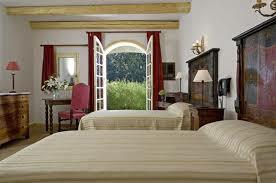 The bedrooms have air conditioning and the furniture is very Provencal. A pool, tennis and restaurant. A less expansive hotel is La Riboto de Tavern, near Val D’Enfer. A great country house half cut out in the cliff face, hidden among tranquil rocks and flowers and furnished with genuine antiques. 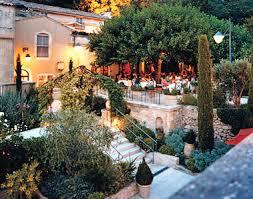 The restaurant is excellent and was noted for simple , fragrant, imaginative local cooking. It has also three bedrooms. 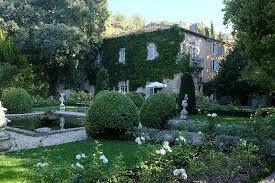 Tomorrow Fontvieille, St- Remy- de- Provence and Tarrascon.